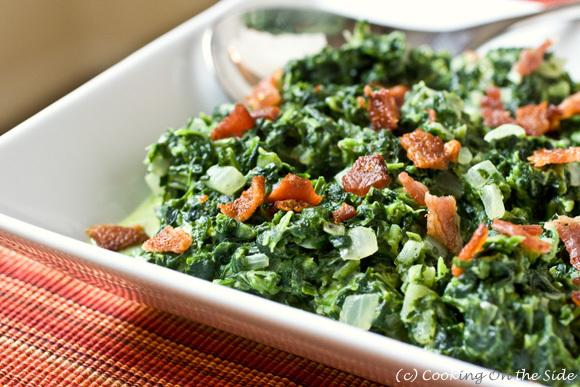 Spinach doesn’t need cream or bacon to make it a good side dish. It’s fine on its own, simply steamed or sauteed with a little lemon. That’s how I typically make it. If you do happen to mix cream and bacon in with spinach – and maybe some aromatic onions and garlic too for extra savory flavor – well, you’re going to wind up with a pretty excellent side dish. This Creamed Spinach, inspired by a recipe I found on the side of a package of frozen spinach, isn’t the extra thick kind I’ve had at steakhouses in the past. Here the sauce is thinner – just the cream or milk alone absorbing into the spinach rather than a flour-thickened bechamel. It’s a little bit lighter without sacrificing flavor. That works for me! Thaw the spinach according to the package directions. Drain as much of the water as you can, in batches, through a fine mesh strainer by pressing the spinach with the back of a large spoon. Set aside. Melt the butter a large skillet over medium-high heat. Add the onions and garlic and cook, stirring occasionally, until they are soft and fragrant, about 2 minutes. Add the drained spinach and cook for another 2 minutes. Stir in the milk or cream and nutmeg and cook, stirring, until the spinach has absorbed most of the liquid, 7 to 10 minutes. 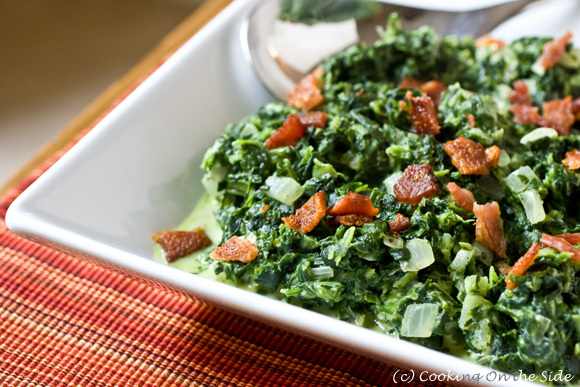 Transfer the spinach to a serving dish and garnish with the crumbled bacon. 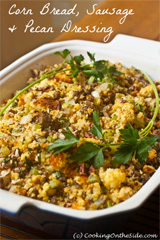 Not for everyday, but I would love this for Thanksgiving! Looks delicious!! I’d eat this is everynight! I agree that spinach doesn’t *need* the added cream or bacon…but why not!?! YUMMY! Looks like Emeril forgot to give instructions on adding the bacon. I assume you add it at the end after cream is absorbed. Nope, that was my omission. Yes, I added it at the very end so it stayed crispy. I’ll update the recipe. Great idea for a Thanksgiving side. Looks delicious and healthy! Wow this looks great! Thanks for sharing. Natalie´s last blog post ..Home from Cuba. I’ve gotta say… there’s bacon! this would be a healthy treat with a little naughty side. oooohhhh….bacon makes everything taste good – just further proof. This looks awesome. 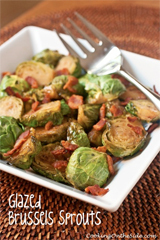 I usually make my veggies without a lot of Butter, cream or fatand but especially around the holidays you have to live a little ….lol. 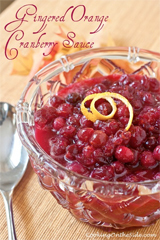 I’m bookmarking this one…yum! Next post: Foodie Gifts on RedEnvelope + $75 Gift Card Giveaway!